A mother charged with imprisoning her three daughters pleaded guilty Monday to fifteen counts of child abuse or kidnapping. Sophia Richter was in tears as she conceded she abused her children. Sophia Richter struggled with emotion as she read statements to confirm her guilt. For privacy, her children are identified by initials. She said, "I committed kidnapping by knowingly restraining....A.A., B.A, and N.P. With an intent to aid in the commission of a felony child abuse." Sophia Richter won the right to a new trial when an appeals court ruled she should have been allowed to claim she locked up and abused her daughters because she was afraid of her husband Fernando. He's serving a 58 year sentence in the case. The couple kept the girls locked in their rooms. In Tucson, the girls escaped and told police they were locked away, fed terrible food, and forced to beg to use the bathroom. Those same girls were in court to support their mother as she pleaded guilty to multiple counts, to live up to a deal that could give her a lighter sentence than her original 20 year sentence and may even lead to probation. Stepfather Fernando Richter was sentenced to 58 years in prison. 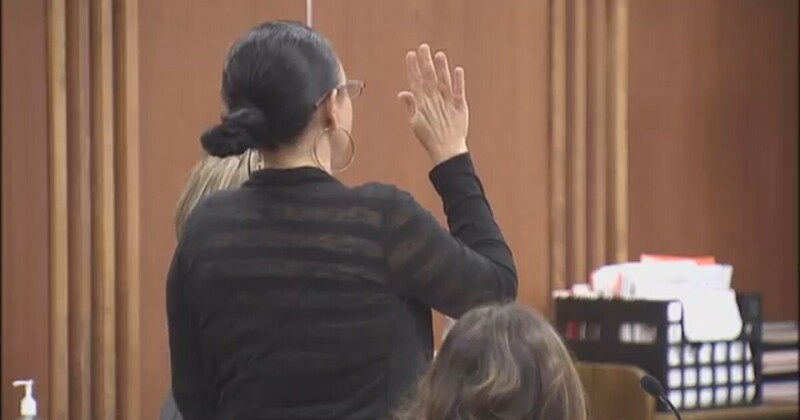 A woman originally convicted of child abuse in 2016 -- before that conviction was thrown out -- reached a plea agreement in court Monday.